Many large corporate meetings and conferences kick off the start of the event program with what is a called an opening session. Opening sessions, also known as plenary sessions or opening general sessions, are most frequently associated with larger conferences, congresses, or conventions, but can be utilized for smaller corporate events as well. Opening sessions are always scheduled for a set period of time at the start of the program usually running between one and two hours. 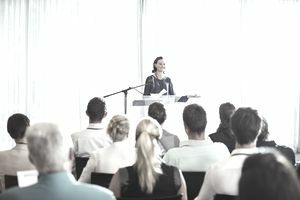 Though not all programs begin with an opening session, the presentations that are scheduled during a general open session can offer event organizers and hosts a unique opportunity to address their attendees. Opening general sessions are characterized by a scheduled presentation or series of presentations by a variety of speakers that are geared toward addressing the general audience. Some event programs eventually offer concurrent breakout sessions in which attendees break into smaller groups for presentations and workshops. Others divide the audience almost immediately for sessions that are dedicated to certain roles, skill sets, or interests. The opening general session, on the other hand, serves as an opportunity at the start of the program to address all event attendees together. During the opening general session, the organizer's leadership may choose to cover general agenda items and outline the objectives of the overall program. Opening sessions also usually include a keynote speaker and other presenters who help set the tone for the convention. These presentations may be held in a variety of formats, but the sessions themselves by definition are open to all attendees. The most effective opening general sessions are those that are organized for the audience and event attendees, not the event organizers. While event organizers can take the opportunity to address company or association business, event logistics, and agenda items, a great opening session should also entertain and motivate the audience. Effective programs require audience engagement and interest. If event organizers lose the audience's interest from the beginning, they must fight to get it back. Opening general sessions should start the program on a strong note. The best opening general sessions will deliver on all of these objectives. For instance, the opening general session for an annual conference may include a welcome message by the organization's president as well as an address from the emcee who will serve as a moderator for the duration of the event. The opening session may end on a strong note with a guest keynote speaker who delivers a presentation about motivating the sales force to achieve company goals.